I last watched the videos for Stanford's CS231n: Convolutional Neural Networks for Visual Recognition almost two years ago, along with a lot of other videos, trying to scramble up the Deep Learning learning curve before I got too far behind. Recently, however, I was looking for some specific information around object detection, so I rewatched the Lecture 11: Detection and Segmentation video on Youtube. This lecture was from their 2017 class, and was taught by Justin Johnson. The lecture covers various popular approaches to object detection and segmentation, and can be summarized by the figure (taken from Darian Frajberg's presentation on Introduction to the Artificial Intelligence and Computer Vision Revolution at Politecnico di Milano) below. What struck me again in the lecture was the incremental nature of the approaches, with each approach building on the one before it. But underneath it all, its the same convolutional and pooling layers with classification and regression heads, just reconfigured in different ways. That is what I will write about in this post today, and I hope by the end of the post, you will agree with me as to how super cool this is. Of necessity, I am going to describe the different networks at a somewhat high level, so if you are looking for more information, I would advise you to watch the video yourself. Alternatively, Leonardo Araujo dos Santos has an excellent tutorial on Object Localization and Detection that also goes into more detail than I am going to. But on to the post. The first computer vision task is Image Classification. Here you train a network with images which can belong to one of a fixed number of classes, and use the trained model to predict the class. The Convolutional Neural Network (CNN) is the tool of choice when it comes to image classification. CNNs have consistently blown away classification benchmarks against the ImageNet dataset starting with AlexNet in 2012. Over the years, networks have grown deeper and some novel extensions to the basic CNN architecture have been developed, and today, image classification against the ImageNet dataset is considered a mostly solved problem. CNN models pre-trained against ImageNet are available for many frameworks, and people often use them to build their own classifiers using Transfer Learning. The goal of semantic segmentation is to label each pixel of the image with its corresponding class label. Naively, this would be done by taking small crops by sliding a window across and down the input image, then predicting the central pixel in each crop. This can be expensive, since an image H pixels high and W pixels wide will have to do H x W operations for a single image. A less expensive approach might be to run your image through a CNN which will increase the number of channels without changing the width and height. At the end, each pixel is represented by a vector of size equal to the number of target channels. Each of these vectors are then used to predict the class of the pixel. While better than the previous approach, this approach is also prohibitively expensive and is not used. A third way is to use a CNN encoder-decoder pair, where the encoder will decrease the size of the image but increase its depth using Convolution and Pooling operations, and the decoder will use Transposed Convolutions to increase its size and decrease its depth. The input to this network is the image, and the output is the segmentation map. The U-Net, originally developed for biomedical image segmentation, contains additional skip-connections between corresponding layers of the encoder and decoder. In the Classification + Localization problem, not only do you have to report the class of the object in the image, you have to report the location. The assumption in a localization problem is that you have a single object in the image. The only addition to a standard CNN pipeline is that this network will have two heads, a classification head and a regression head that reports the bounding box coordinates (x, y, w, h). The convolutional part of the network will output a vector for the input image that is fed to a pair of dense networks jointly -- the classification head uses some sort of categorical loss function and the regression head uses a continuous loss function, combined with an additional scalar hyperparameter. You can train the networks separately and fine tune them jointly. Depending on where you place the regression head -- if placed before the fully connected layers, it is called the Overfeat or VGG style, and if placed after, it is called the R-CNN style. The Object Detection task is the same as the Classification + Localization problem, except we now have multiple objects in the image, for each of which we have to find the class and bounding box. We don't know the number or the sizes of the objects in the image. This is a hard and almost intractable problem if we have to compute random crops. The first solution is to use an external tool from computer vision, such as Selective Search, to compute "blobby" areas of the image as possible areas where objects might be found. These areas are called Region Proposals. Proposals are resized and used to fine-tune a Image classification network, which is then used to vectorize the images. Multiple binary SVMs (one per class) was used to classify the object between object and background, and a linear regression network was used to correct the bounding boxes proposed in the region proposals. This was the Region Proposal Network, or R-CNN. The first improvement, called the Fast R-CNN, still gets the region proposals from an external network, but projects these proposals to the output of the CNN. An ROI Pooling layer resizes all the regions to a fixed size and pass the vector for each region to a classification and a regression head, which predicts the class and bounding box coordinates respectively. The next improvement, called the Faster R-CNN, gets rid of the external Region Proposal mechanism and replaces it with a Region Proposal Network (RPN) between the Deep CNN and the ROI Pooling layer. The output of the RPN and the output of the CNN are fed into the ROI Pooling Layer from which it is fed into the fully connected part of the CNN with a classification and regression head to predict the class and bounding box for each proposal respectively. The speedup of a Fast R-CNN over the R-CNN is about 25x, and speedup of the Faster R-CNN over a Fast-RCNN is 10x, thus a Faster R-CNN is about 250x faster than a R-CNN. A slightly different approach to the Object Detection task was taken by the class of networks called Single Shot Detectors (SSD), one of which is the YOLO (You Only Look Once) network. The YOLO network breaks up the image into a 7x7 grid, then applies a set of pre-determined bounding boxes (B) with different aspect ratios to each grid. For each bounding box, it will compute the coordinates (x, y, w, h) and confidence for the object bounding box coordinates and the class probabilities for each of C classes. Thus the image can be represented by a vector of size 7 x 7 x (5B + C). The YOLO network is a CNN which converts the image to this vector. Instance Segmentation Tasks are similar to Semantic Segmentation, but the difference is that it distinguishes between individual objects of the same class, nor does it aim to label every pixel in the image. In some ways Instance Segmentation could also be considered similar to Object Detection, but instead of a bounding box, we want to find a binary mask the contains each object. The network that is used for this task is the Mask R-CNN. Mask R-CNN adds an additional mask predicting branch (another CNN) to the regression head of a Faster R-CNN. This is applied to every region proposed by the RPN in the Faster R-CNN. The mask predicting branch converts the bounding box for each proposal into a binary mask. This concludes my post on Object Detection and Segmentation networks. As you can see, while the networks have grown progressively more complex as the tasks got harder, they are composed of (mostly) the same basic building blocks. Some things to note is the gradually making networks learn end-to-end, by moving as much learning from the outside to inside the network. I hope you enjoyed my high level overview on the composability of CNNs for different computer vision tasks. I have deliberately tried to keep the descriptions at a fairly high level. For more depth, consider watching the lecture on which this post is based on, or consult one of the many tutorials on the Internet that go into each network in greater detail, including the tutorial I mentioned earlier. Using Autoencoders as anomaly detectors is not a new idea. For examples, see here, here and here (results of a google search "autoencoder anomaly detection"). However, one other possibility could be to use an autoencoder as a feature detector for specific features, for example, to look for specific kinds of objects in images. So assuming you wanted to detect domestic animals in images, you could train a set of autoencoders, each trained on a single animal, then run the image through the set. The intuition is that, assuming the image has a cat in it, an autoencoder trained on cat images should be able to reconstruct the image with lower reconstruction error than it would for other animals. In this post, I describe an experiment where I train an autoencoder on cat images from the Kaggle Cats and Dogs Dataset, and compare reconstruction errors on a held-out set of dog and cat images. The Kaggle Cats and Dogs dataset contains images of 12,500 cats and 12,500 dogs, both color and monochrome. I picked a random sample of 2,500 images each of cats and dogs as my held-out test set, and trained my cat autoencoder on the remaining 10,000 cat images. The autoencoder was trained on monochrome images for 50 epochs. I then compared a few random images and the reconstructed image (input and output of the autoencoder) and it looks like the autoencoder has learned to reconstruct the images quite nicely, as you can see below. 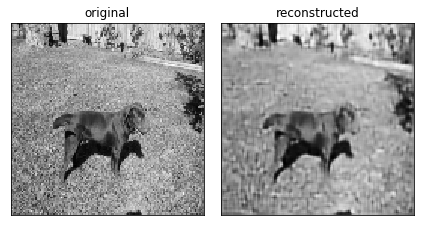 As expected, the autoencoder seems somewhat better at reconstructing cat images compared to dog images (Root Mean Square Error (RMSE) between original and reconstructed image for the cat and the dog image above is 0.04304 and 0.07650 respectively). 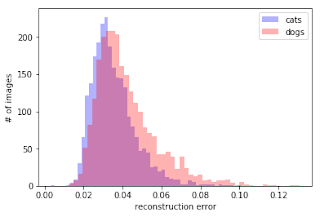 I then computed reconstruction errors (RMSE again) for the held out set of 2,500 cat and dog images and plotted the distribution of reconstruction errors, which is shown below. 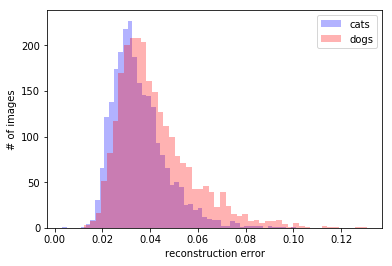 As you can see, while there is quite a bit of overlap between the two distributions, the distribution of reconstruction errors for cat images peaks earlier and is skewed left a little more than the distribution of reconstruction errors for dog images. It also looks like the distributions are approximately normal, so we can use the t-test to detect if there is statistically significant difference between them, as explained on this page. Turns out that the t-value is 16.94 &Gt; 3.291, so we can conclude that the distributions are different at 99% confidence level. 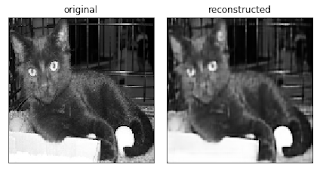 Since the distributions of reconstruction errors are approximately normal, and since we can represent a normal distribution by the mean and standard deviation, we can now compute the probability of an image being that of a cat based on its reconstruction error. For example, our cat and dog exampleis have a 80.3% and 0.15% chance of being a cat respectively (code for calculating these probabilities is provided later in the post). This gives us a way to use the autoencoder as a binary cat classifier. So that was a brief overview of the idea and the results from my experiments. Now I will describe the experiment in more detail, along with the code, so you can replicate the results for yourself, should you find it interesting enough to do so. The images are provided in a directory structure that looks like this. The Cat and Dog directories each contain 12,500 images of varying sizes, both monochrome and color. We randomly sample 2500 images each from each collection as our held-out test set and write the filenames to flat files test-cats.txt and test-dogs.txt. The remaining 10,000 cat images are written into train-cats.txt. We use these files as inputs to a custom image generator. We standardize our input images to all be monochrome and size 128 x 128 pixels. Most images have 3 channels (Red, Green, Blue) which we coalesce to a single channel using the Luminosity formula defined here. Some images had 4 channels (RGB + Alpha channel), for which we first discarded the Alpha channel and applied the same Luminosity formula to the remaining channels. A few files could not be read and were discarded. A few others had issues with its EXIF headers, which seems a spurious problem without a solution in the Pillow package according to this issue, which I ended up discarding as well. Because we are referencing the image files via text files, "discarding" an image is just commenting out its file name. In all, 24 filenames in all were discarded in this manner, 13 from the training set and 5 and 6 from the cat and dog test sets respectively. The code to pre-process incoming images into a (128, 128) monochrome images is shown below. One thing to note is that the skimage.transform.resize() method not only resizes the image, but also silently rescales the pixel intensities from the [0, 256] range to the [0, 1] range. Discarding the problem images was semi-manual. I would repeatedly loop through the three lists of files, looking for exceptions, using the following code. Once I found one, I would comment it out so it would get ignored in the next run. To save time, I did a little trick with global variables, so I could start with the file I left off, that bit is commented out. The code below should run without errors once all the offending files are commented out of the list. The autoencoder design is based on the one Aditya Sharma describes in his blog post on Reconstructing Brain MRI Images using Deep Learning (Convolutional Autoencoder). The network consists of 2 blocks of convolution and maxpooling layers for the encoder, followed by a final convolutional block, followed by 2 blocks of convolution and upsampling for the decoder. Input to the network is mini-batches (of 128 images each), each image having the shape (128, 128, 1). Here is the code to build the autoencoder. 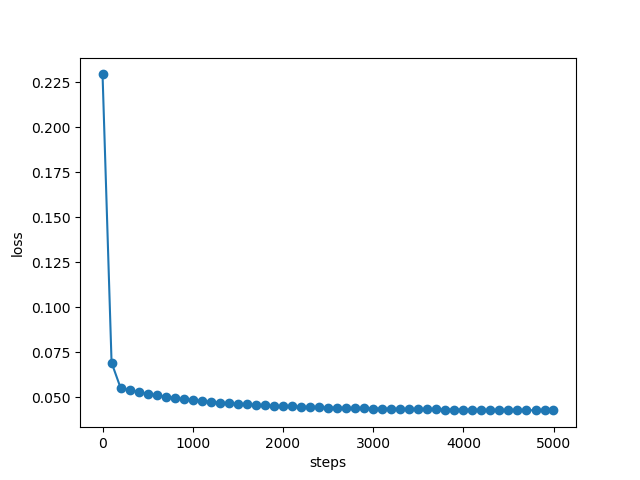 The loss function is Mean Square Error, since we want to minimize pixel-wise reconstruction error, and the optimizer we use is RMSProp with a learning rate of 0.0003. As I had mentioned earlier, I use a custom image file generator based on my 3 text files, which point to the actual image files. To build it, I combined ideas from Arindam Baidya's blog post on How to increase your small image dataset using Keras ImageDataGenerator and Nilesh's post on Writing Custom Keras Generators. Essentially the idea is to build a generator function that reads the flat files to yield batches of images, which the Keras ImageDataGenerator calls using its flow() method. To be clear, I didn't end up using any image augmentation (which is probably the biggest reason to use the ImageDataGenerator). I did try augmenting initially, but my training was not converging, which I later found to be because I was mistakenly augmenting my validation set as well. In any case, I turned off augmentation for both, since I had 10,000 images, which I figured would be more than enough to train the autoencoder. Here is the code for the generator function images_generator() and the wrapper function custom_generator(). In the code snippet below, the training set of 10,000 cat images is split 90/10 into a training set and validation set. We then declare custom generators on top of these image lists, and call the autoencoder's fit_generator method, training it for 50 epochs on a AWS p2.xlarge EC2 instance. 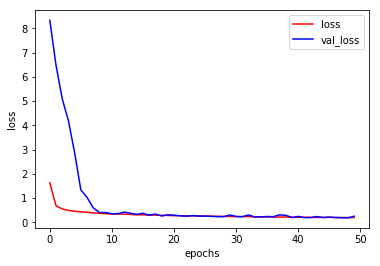 The learning curve for the autoencoder training shown below shows that both the training and validation losses are decreasing and converging nicely. The ModelCheckpoint callback ensures that the best model (based on the validation loss) is saved, so we can use this saved model to do our evaluations. The first evaluation I did was a few spot checks, where I rendered the input and reconstructed image (by running the input image through the trained autoencoder) side by side and computed the reconstruction error. Code for that is shown below. This code was used to produce the first two images of the cat and dog earlier in this post. I followed this up by computing the reconstruction error across 2,500 cats and 2,500 dogs in the held-out test set, and plotting the results in a pair of histograms. I then computed the t-value to determine if the two distributions were different with some reasonable confidence level. The code for this is shown below. This code was used to produce the overlapping histograms earlier in the post. And finally, here is the snippet for computing the probability of an image being that of a cat, given the reconstruction error from the cat encoder. 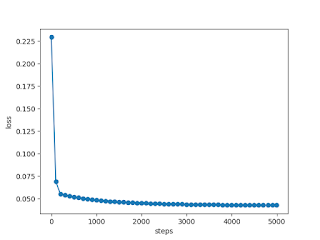 Essentially, I compute the value of the normal distribution at the reconstruction error point, normalized by the (maximum) value at the mean. 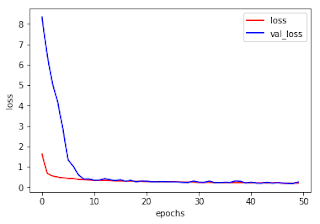 To conclude, in addition to being good at feature compression and anomaly detection, I believe autoencoders can also be useful to build complex classifiers (or feature detectors for more complex classifiers) by building on existing collections of pre-classified data. I did this experiment as a proof of concept to convince myself that this was indeed a viable approach, hopefully I have managed to convince you too.